↑ Jordan, Mary (September 30, 2015). "Meet Melania Trump, a New Model for First Lady". The Washington Post. 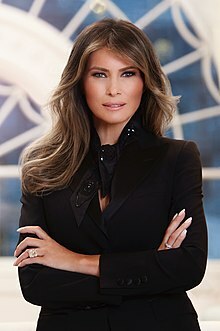 https://www.washingtonpost.com/politics/meet-melania-trump-a-new-model-for-first-lady/2015/09/30/27ad0a9c-6781-11e5-8325-a42b5a459b1e_story.html. अन्तिम पहुँच तिथि: October 1, 2015. ↑ "Melania will be the first non-US born first lady since?" (enमे). PolitiFact. https://www.politifact.com/truth-o-meter/article/2016/jul/18/melania-trump-could-be-first-non-us-born-first-lad/.